If your motorcycle won’t start, then there are some things you will have to check. That said, nothing is quite as disappointing as wearing your helmet, getting on your bike, and trying to start it to no avail. When this happens, it is likely that you will feel frustrated and disappointed by your motorbike. 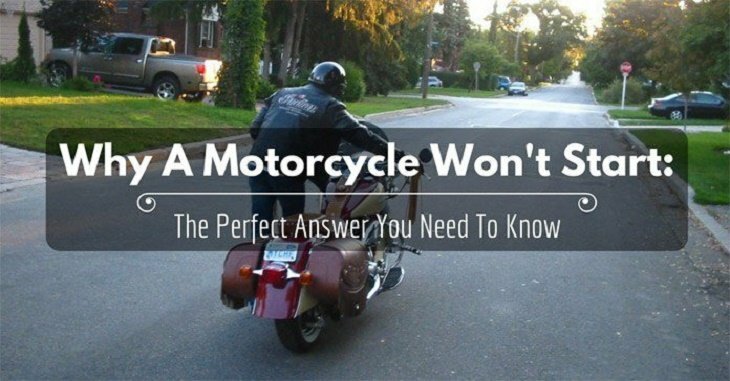 However, before you decide to call it quits and use an alternative vehicle to your destination, you should first try to understand why your motorcycle won’t start. That said, the main components in an ordinary bike that cause it to run include compression, air/fuel mixture, and spark. This means that a bike will either refuse to start or run rough if it doesn’t have the right amounts of any or all of these components. When you get here, you can trace the issue until you get to the root of the problem. To check your plugs, get them from the cylinder head, remove them, then plug them right back into the plug cap. Holding the spark plugs up to any piece of metal (such as the head bolt), turn over your engine. If you do it correctly, you’ll see a spark from the electrode going towards the metal part. With regards to the fuel and air mixture, you also need to check for some obvious issues. For instance, as you continue wondering why your motorcycle won’t start, find out if the fuel petcock is on reserve or turned on. Similarly, check if you have gas in the tank. Most riders encounter fuel problems when they try starting a bike that was in storage for a considerable period. Gas tends to break down over time especially if you didn’t stabilize it properly. When combined with ethanol, gas will also break down even further and faster. The key here is to always use fresh gas. 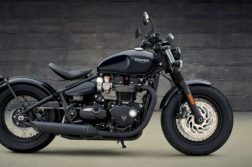 When a motorbike sits for long durations, the fuel system might also dry out. Therefore, you should check the fuel lines to ensure that the gas is getting to your throttle body or carbs. At times, fuel lines on bikes tend to dry out before cracking. Similarly, fuel filters might become plugged, making it difficult for them to allow enough (or any) gas to pass through. In older carbureted motorcycles, you will need to use some carb cleaner or starting fluid. Spray it into the carb intake before you start your bike. When the engine fires the starting fluid, it will also draw the gas right through the fuel system. However, if the bike continues dying even after you’ve run the starting fluid, consider other problem areas. Remember, even starting fluid won’t lubricate all the cylinders properly – particularly after extended use. As such, you should only use it sparingly. Clogged vent tubes in the gas tank might also restrict the flow of gas through the entire bike system. Another one of the fuel issues to check when your motorcycle won’t start is flooding. The best way to un-flood an engine is by removing the spark plugs, turning the choke off, and turning your motor over to drain all the excess gas. If you have time, allow the motorcycle to sit until everything evaporates. If you’re at this point and the motorcycle won’t start, you should clean your carbs. When old gas breaks down within a bike’s carburetor, it might leave green gunk behind. This gunk blocks the jets in the system. After cleaning your carbs, therefore, you should ensure that the fuel pump is working well. Of course, bikes need the perfect amount of air to mix with gas for them to start. A loose or broken vacuum line might cause too much air to be drawn into the bike’s combustion chamber. This will, inadvertently, alter the mixture of air and fuel. As a result, your engine won’t be able to ignite the mixture well. Therefore, you should check the vacuum lines for any holes or cracks. Conversely, the culprit behind why your motorcycle won’t start might be that the airflow is too little. To correct this, check to see if air can easily pass through the air intake filter. If the filter is dirty, you know what to do. When your motorcycle won’t start, test for compression. The result from this test might prove to be the most devastating. That said, your motorbike’s engine won’t fire up properly (or at all) if any of the cylinders have low (or no) compression. You need to compress the air and fuel mixture to raise the temperature to a point where the mixture burns. Unless the compression is adequate, therefore, your mixture will refuse to ignite. You’ll need quite a bit of money and time to fix these issues in comparison to the problems discussed above. Talk to an experienced motorcycle mechanic for help. Finding the problem when your motorcycle won’t start is the first step to correcting it. Hopefully, this guide should help you do exactly that. Use the steps above – going through each one carefully – the next time your bike refuses to power up.